Have a story? Send it to us. 2. You may mail it to: The Hinesburg Record, 327 Charlotte Road, Hinesburg, VT, 05461. 3. You may send an article via email to: therecord@gmavt.net To keep editing tasks to a minimum, The Record requests that all submissions adhere to the above guidelines. 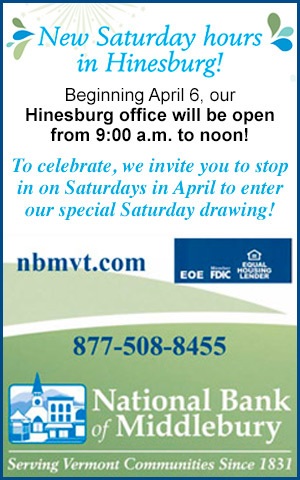 The Hinesburg Record is an independent, non-profit community newspaper run by volunteers. Publishing 10 times per year since 1987, The Hinesburg Record is mailed to 2100 Hinesburg households, over 50 paid subscribers and is delivered to surrounding communities for a total circulation of 3000. The paper is a four-column format tabloid with an image size of 10” x 15.75” and averages 24 pages. Please send all articles as email attachments in .doc or .rtf format. Images should be attached in separate files in .jpg format. Click here to download publication guidelines.